Naturally Flavoured icons/nutritional/naturally-flavoured Created with Sketch. Finally, a protein powder made just for you that tastes as amazing as a caramel frappe so you can satisfy your sweet tooth without sabotaging your waistline! Why use IdealFit Protein Powder for Women? 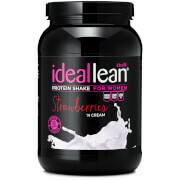 IdealFit’s lean protein shake is great for your fitness goals. Most standard protein shakes use whey concentrate but our IdealLean shake uses whey protein isolate powder to deliver a higher protein content with lower fat, carbs and sugar than most shakes on the market. Not only that, but because we make products specifically designed for women, our female nutritionist has further enriched IdealFit whey proteins with vitamin D and calcium to support healthy skin, teeth and bones and B vitamins including biotin and pantothenic acid to delay fatigue and support mental performance throughout the day. Lastly, we’ve even added the amino acid L-glutamine to further support your training. Who can benefit from a whey isolate protein supplement? Whey protein isolates can be easier to digest as they are filtered to contain less cholesterol (as well as fat and sugar) than whey concentrate powders, ideal if you are lactose intolerant. Its important to make sure you get enough high quality protein in your diet and if you’re training and exercising the demand for protein becomes even more important for health and results. When consumed as part of a healthy diet, protein can help you feel fuller for longer and along with regular resistance training, the increased protein concentration of whey isolate powders can help muscle maintenance and so is often taken post workout for those who are looking to recover. Ideal for post-workout recovery and muscle growth. Mix 30g of powder (1 scoop) with 200 - 300ml of cold water. Store in a cool, dry place away from sunlight. Once opened replace lid securely after use. For best before end date see lid. Suitable for vegetarians. Our products are not suitable for pregnant or breastfeeding women or children under the age of 18. If you have a pre-existing medical condition, seek medical advice before embarking on a meal plan. Whey Protein Isolate (82%) (Whey Protein Isolate (Milk), Emulsifier (Soy Lecithin)), L-Glutamine, Flavourings (Fat Reduced Cocoa Powder, Sweetener (Sucralose), Flavourings, Colour (Caramel)), Calcium Carbonate, Vitamin Blend (Pantothenic Acid, Biotin, Vitamin B6, Vitamin B12, Thiamin, Riboflavin, Folic Acid, Niacin), Fat Reduced Cocoa Powder, Acai Powder, Blueberry Powder, Mangosteen Extract (4:1), Vitamin D3, Chromium Picolinate. * Reference intake of an average adult. Tried many flavours but mocha is my favourite. Mixes well too. Taste great stored into Greek yogurt! Service is always quick and reliable too. 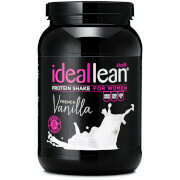 I have tried many different protein shakes and this Ideallean Caramel Mocha is by far my favourite! I have it with water and it tastes incredible. Since I've been using this protein shake, I have seen such a difference in my body and performance at the gym. Muscles are more toned than ever and really helps with fatigue. I can 100% recommend this product. 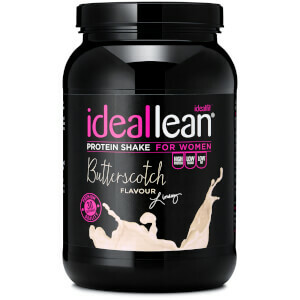 The quality is amazing and even though I use the protein daily, 900g lasts so long. Definitely worth investment. Great taste, easy to mix, does not feel heavy on your stomach. I would buy this one again! I purchased the sample pack and caramel mocha has been my favourite by far. I usually mix my protein with water and a few spoonfuls of Greek yoghurt to cut out the sweetener taste and lots of ice. If you like your iced coffee stronger just add a shot of espresso and tablespoon of raw cocoa powder. I prefer a more dark chocolate flavour. I was so sceptical at buying protein again due to previous experiences of chalky texture and overly sweet taste. This product is beautiful so nice to drink mixed with 100ml skimmed milk 100ml oat milk lots of ice like an iced coffee. Would highly recommend! Works great with half cup water and half almond/ oat milk. Super yummy with berry spinach smoothies too. Masks the greens!!!! Wish they start more flavours like this for a vegan blend. I am a vegetarian but trying to become a vegan. This flavour is absolutely delicious! 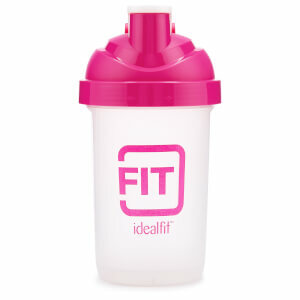 I love using it to help me reach my protein target each day. I mix it into my oatmeal and Greek yogurt, or just drink it mixed with some almond milk. It also tastes great blended into smoothies! Would highly recommend. It is a wonderful taste. My favorite!!! This is the first Protein shake I have tried and now I wish I had bought the samples first. It wasn't grainy or chalky like I've heard about other shakes I just didn't like the flavour and it had a strange after-taste so I've started adding a shot of espresso to try and cut the after-taste but will definitely be trying a different flavour next time.